Philadelphia, PA — The Wharton School of the University of Pennsylvania has announced that Wharton MBA and Perelman School of Medicine alumnus Dr. Mehmet Oz, MD, will be the featured speaker at the School’s MBA graduation in Philadelphia. 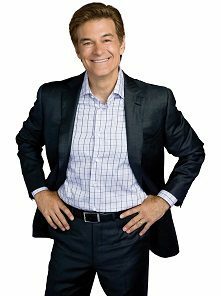 Dr. Oz is the two-time Emmy® Award-winning host of the Emmy® Award-winning and nationally syndicated “The Dr. Oz Show,” Vice-Chair and Professor of Surgery at Columbia University and a best-selling author. The May 13, 2012, ceremony will occur at 1 p.m. at the Palestra, 33rd and South Streets, Philadelphia, PA.
Dr. Oz, who still performs more than 100 heart surgeries a year, began his medical career as an MBA-MD degree student graduating in 1986 with diplomas from both Wharton and the University of Pennsylvania’s Perelman School of Medicine. In 1995, he was instrumental in founding the Complementary Care Center at Columbia Presbyterian Hospital. He launched his first TV series, “Second Opinion with Dr. Oz,” on the Discovery Health Channel in 2003. Dr. Oz has authored seven New York Times Best Sellers, including “YOU: The Owner’s Manual,” “YOU: The Smart Patient,” “YOU: On a Diet,” “YOU: Staying Young,” “YOU: Being Beautiful,” “YOU: Having a Baby,” “YOU: The Owner’s Manual for Teens,” and the award-winning “Healing from the Heart.” He has a regular column in O, The Oprah Magazine, Time and AARP, and his article “Retool, Reboot, and Rebuild” for Esquire magazine was awarded the 2009 National Magazine Award for Personal Service. In addition to belonging to every major professional society for heart surgeons, Dr. Oz has been named Forbes magazine’s #3 most influential celebrity (2010-2011), one of Time magazine’s 100 Most Influential People (2008), one of Esquire magazine’s 75 Most Influential People of the 21st Century, a Global Leader of Tomorrow by the World Economic Forum (1999-2004), and one of “The Harvard 100 Most Influential Alumni” by 02138 magazine. He is the recipient of the Ellis Island Medal of Honor (2008), the prestigious Gross Surgical Research Scholarship, and an honorary doctorate from Istanbul University. He was voted “The Best and Brightest” by Esquire, a “Doctor of the Year” by Hippocrates magazine and “Healer of the Millennium” by Healthy Living magazine. Dr. Oz is annually named a highest quality physician by the Castle Connolly Guide and other major ranking groups. In 2007, Dr. Oz and his wife, Lisa, founded HealthCorps which, using the Peace Corps as a model, encourages young college graduates to spend two years in high schools educating students about wellness issues. Previous Wharton MBA graduation speakers have included Connie Duckworth (WG’79), Jon Huntsman Jr. (C’87, HON’10), Robert Kapito (W’79), Lakshmi N. Mittal (PAR’96) and Muhammad Yunus (HON’09). Information about the University of Pennsylvania’s 256th commencement ceremony is available at: www.upenn.edu/commencement.